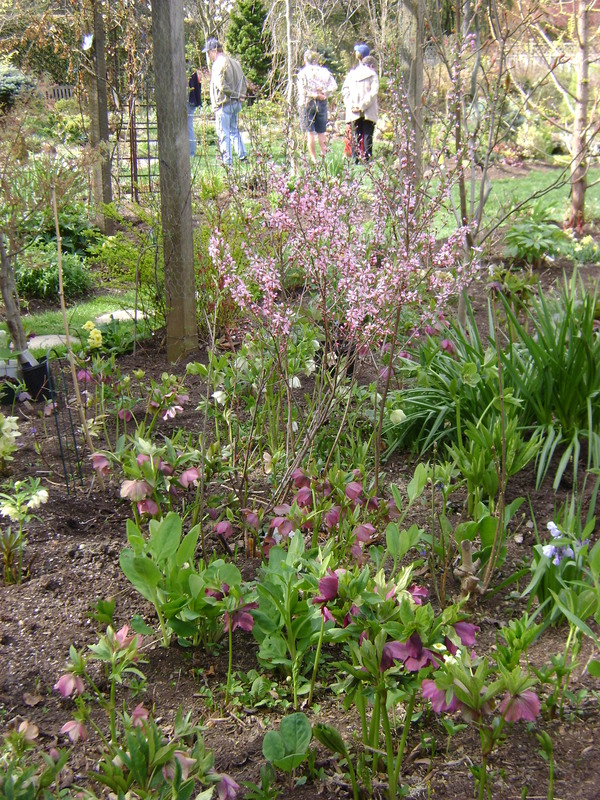 I know the Toronto Botanical Society’s Rosedale garden tour was a couple of months ago. I soooo wish I could have gone on it, but was flying back to Barbados that weekend. But I wanted to share a garden with you that is gorgeous enough to be on it. 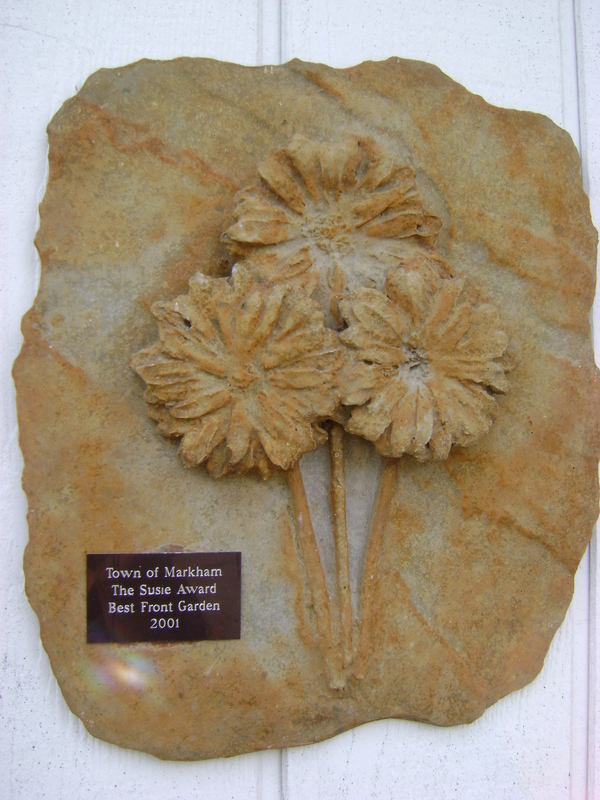 It is also in Rosedale, and belongs to a friend of mine. We met in Barbados through my neighbour, and immediately bonded over gardening. 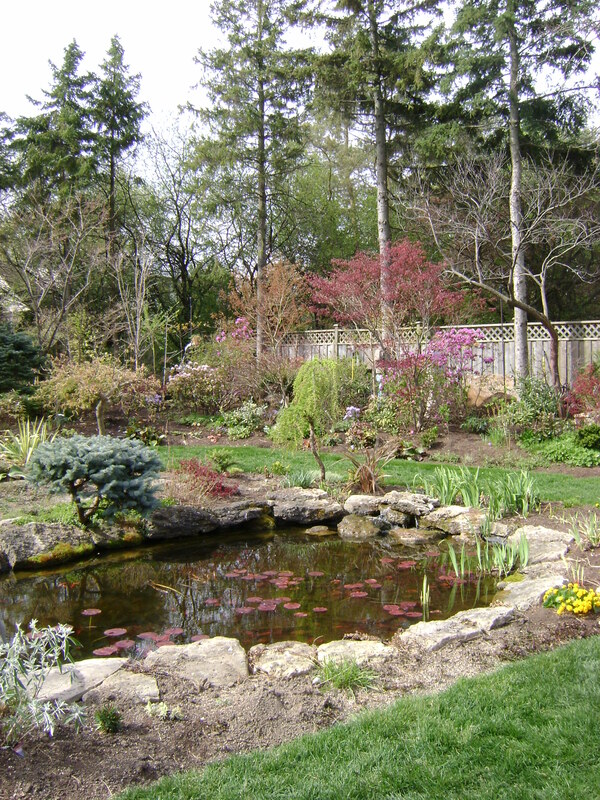 When I returned to Canada in May, I was invited for lunch and a garden tour. 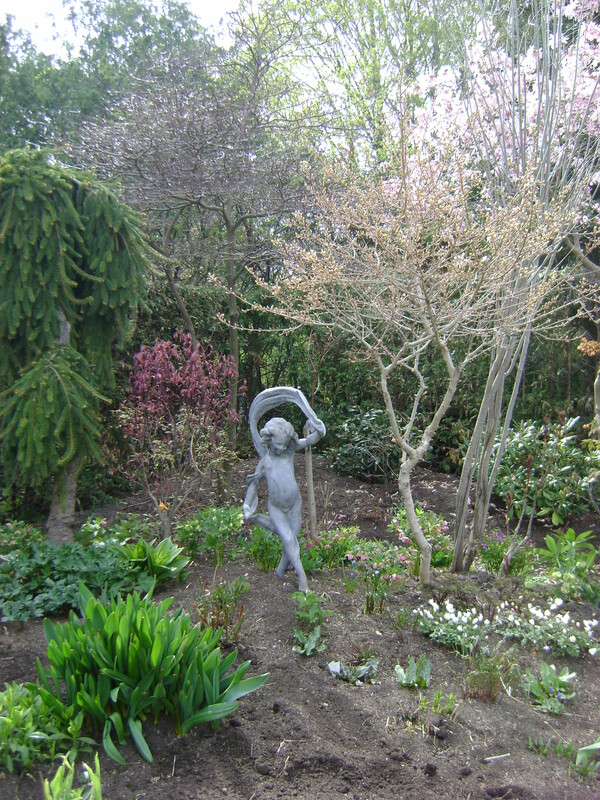 This garden was a true labour of love for my friend, thought about in great detail and it shows. 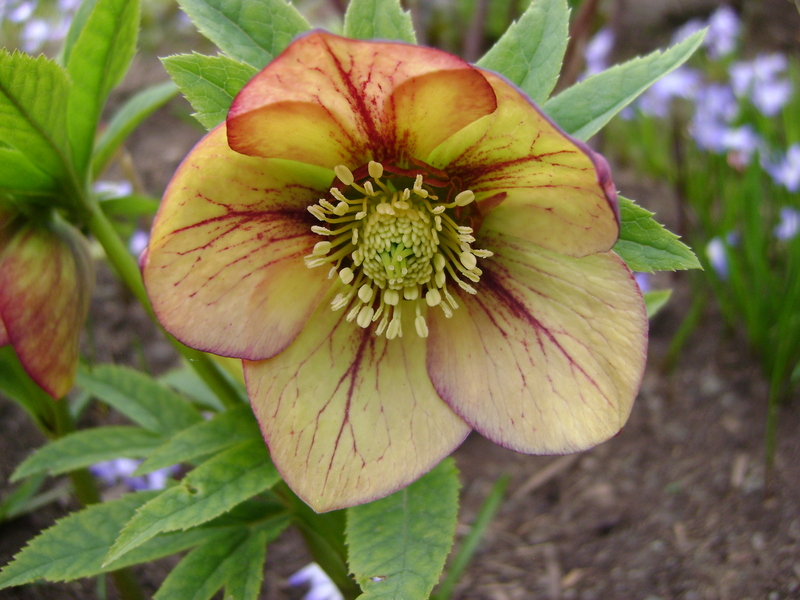 We are both huge fans of structure in the garden, both hard and green, flowers while gorgeous are an accent to the space. You enter through two massive beech hedges, kept softly in shape rather than firmly clipped. repetition at its finest. 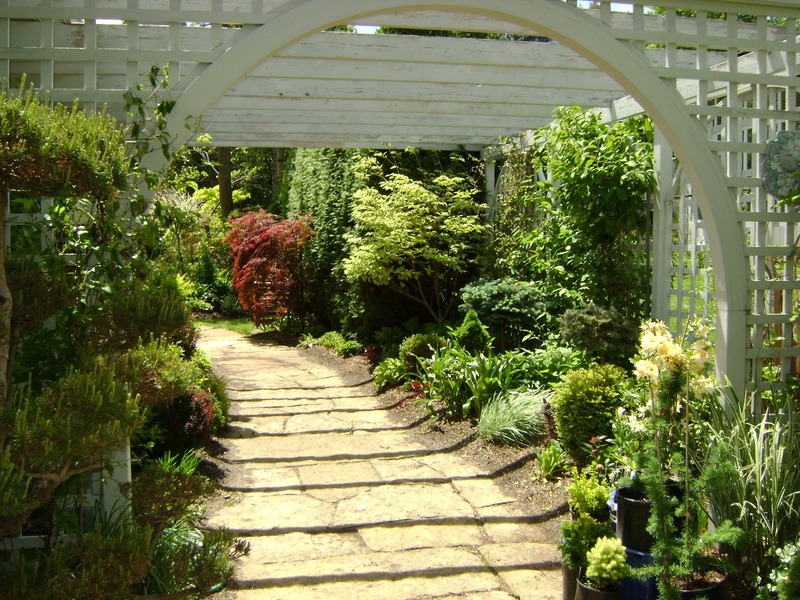 A yew hedge separates the house from the sidewalk and encloses two more planting areas. 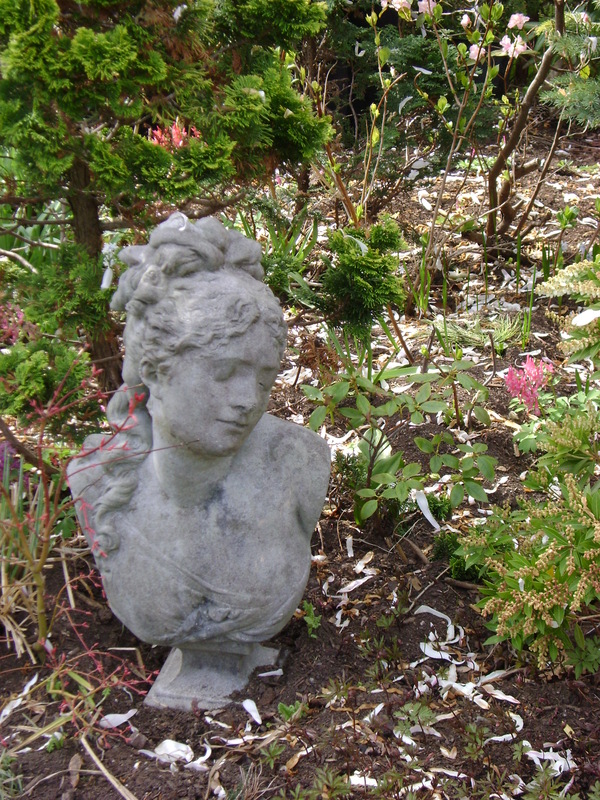 Another enclosure of clipped box is a frame for peonies and sedum, both plants that look good all year. 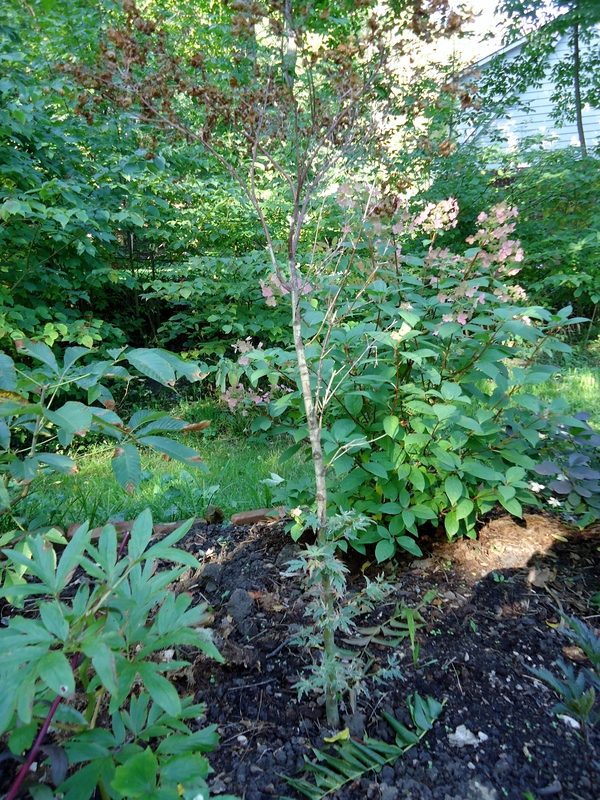 A serviceberry accents one corner, allowing for early season blooms. On the other side, directly under the window is a box parterre. 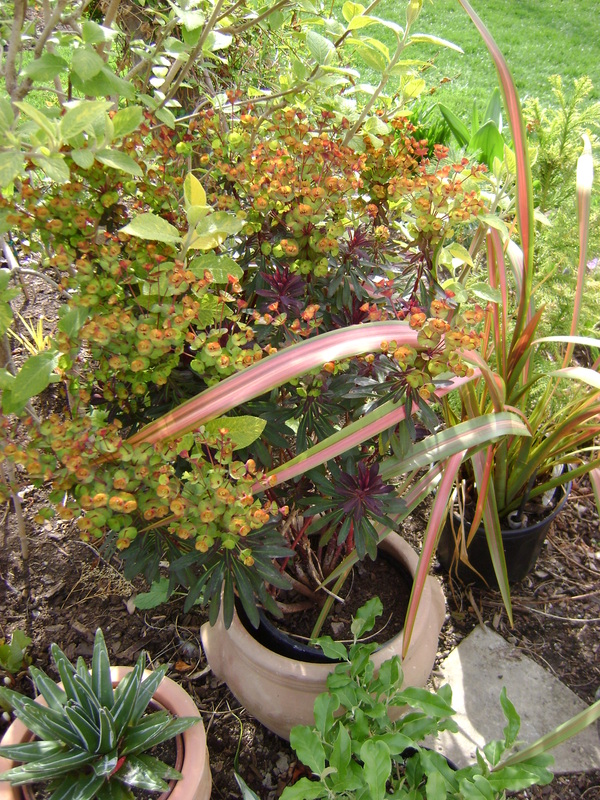 This is accented seasonally with a colourful annual, this year a dark coleus was planted. I love the structure and shapes in the front garden. 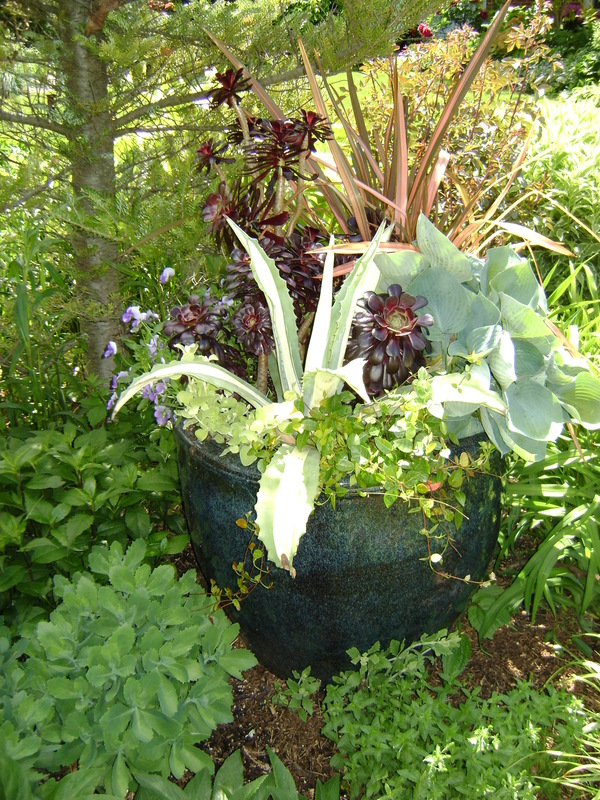 Even if you did not have any flowering plants in it, the different colours of green and textures make it interesting. I took this photo from the third floor so you could get a good look at the overall design of the back yard. 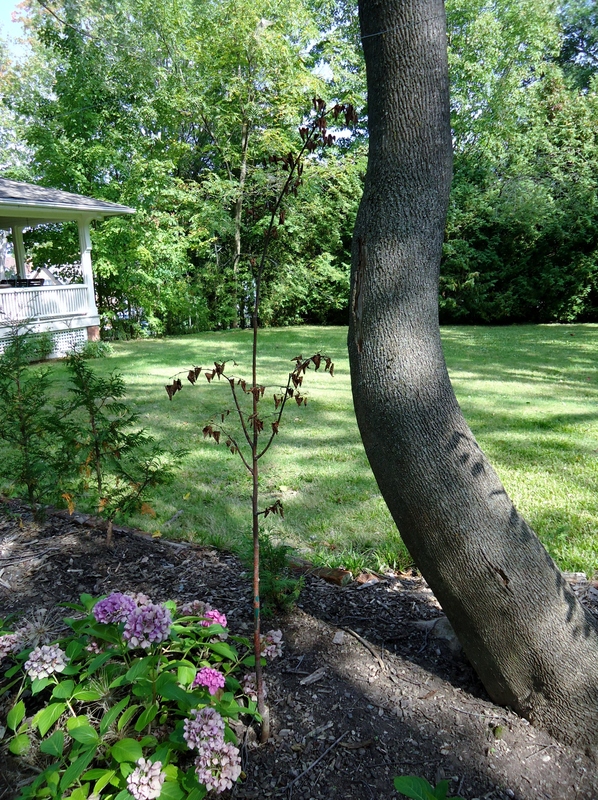 The back yard is divided into three main areas. A lovely brick garage has been accented with trellis-work, breaking up the expanse and allowing roses and clematis to climb. Beside it is the dining area, bordered by box, heuchera and carex. Two steps down and you arrive at a small sitting area where you can admire the pool with its infinity edge. Water pours out of four opening into the pool allowing the sound to mask any city noise. The copper beech hedge looks dark and mysterious against the light stonework of the pool. This provides a lovely backdrop in the third area, which is the main sitting area. Two identical small buildings are joined by columns, roof and backed by a large mirror. This not only hides the neighbours beside them, but the mirror doubles the size of the garden, you can see the pool (and me) reflected in it.The overturned pot on the pedestal is planted up by now, usually with grass, which is also reflected. Changing the flooring material sets off the sitting area beside the pool, the brick looking like a carpet. 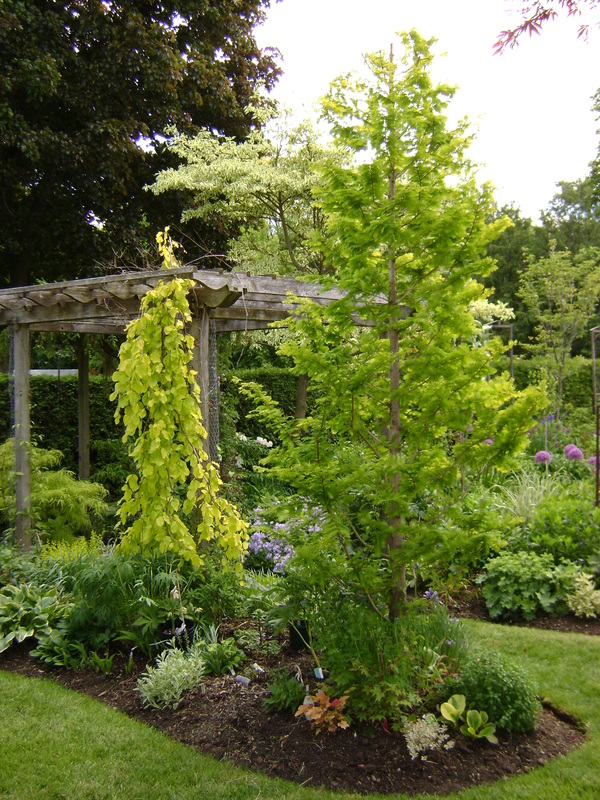 Four laburnum trees are also enclosed in diamond shaped box, that is also underplanted with coleus for colour later in the season. 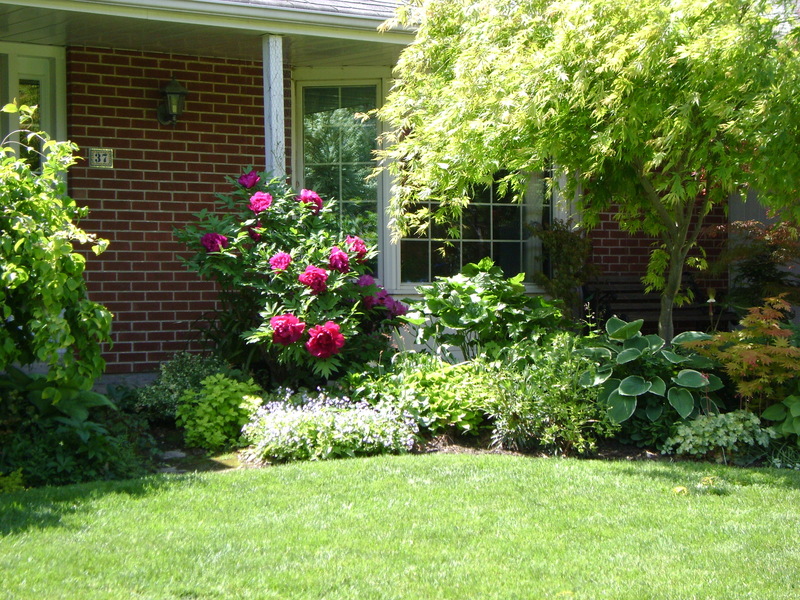 Box hedges edge the garden here as well and act as a frame for the hydrangea, fern and hostas that are planted behind them. 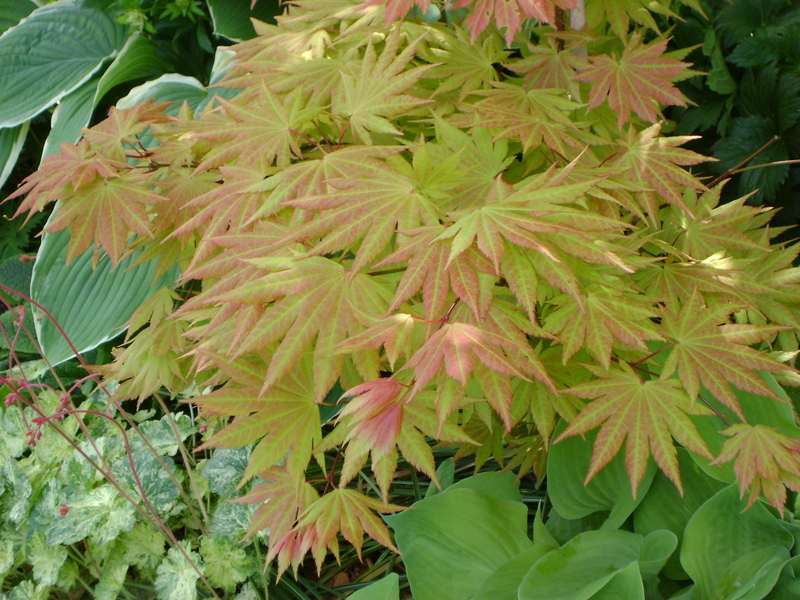 The japanese maple beside the pool is the only remaining plant from the original garden. It was dug up and saved off site while the hard landscaping was going on. 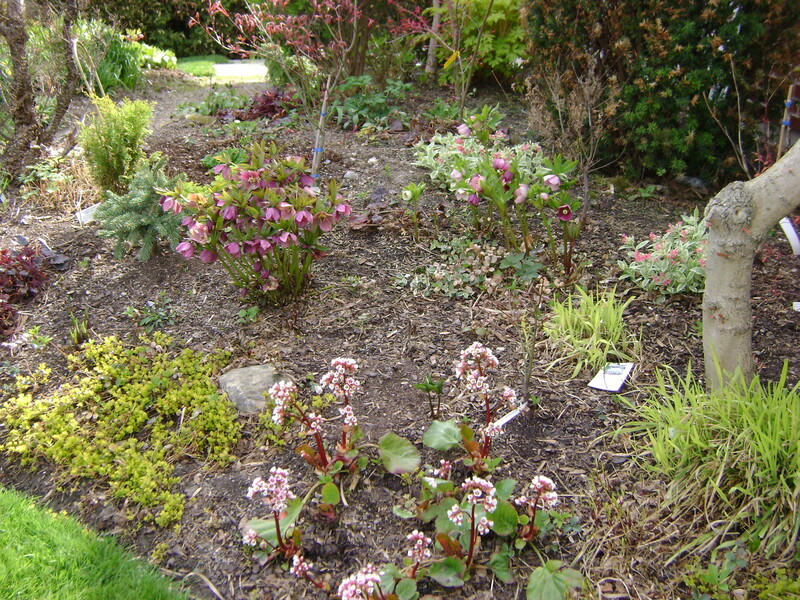 Then it was returned and replanted, and it certainly adds to the overall scheme with its size and colour. Love it against the blue of the pool. 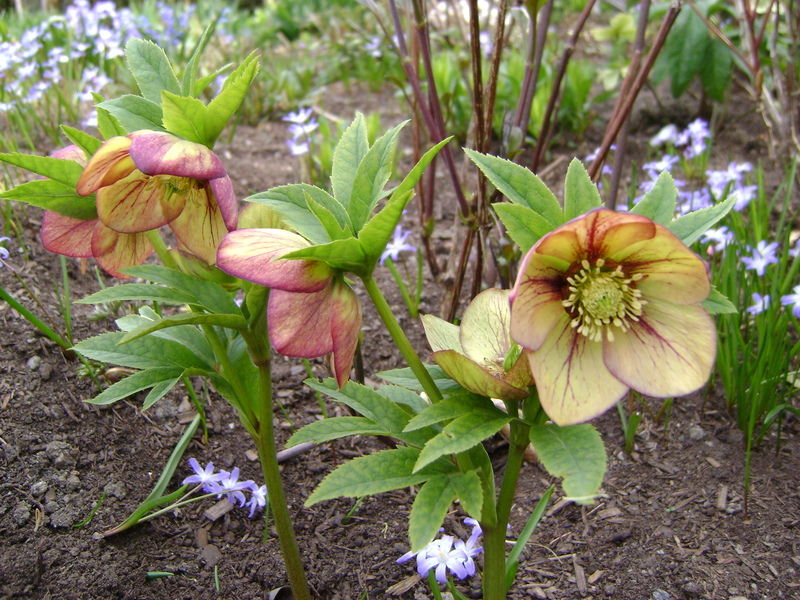 Although there are not a lot of perennials in this garden, there is colour all year. This garden was designed to be low maintenance (although I am sure you do not believe it). 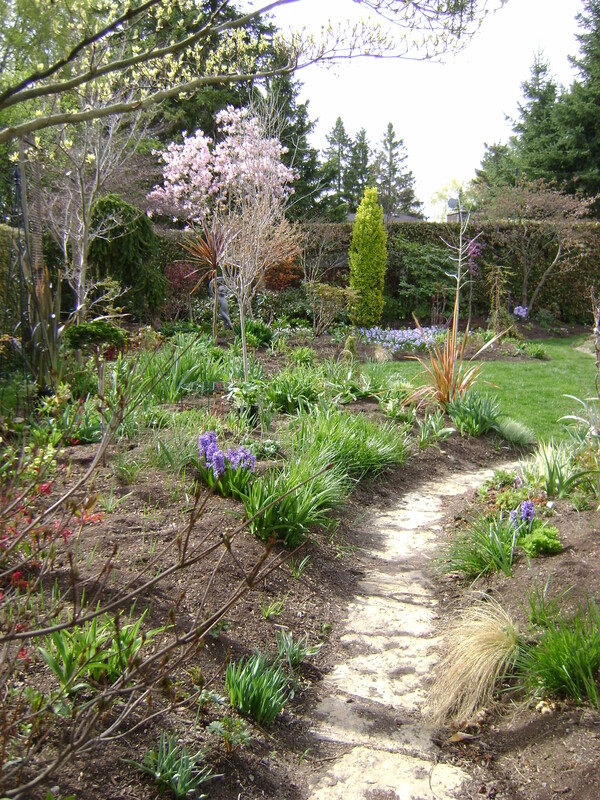 The hedges are cut a couple of times each year, and the rest is really just a few varieties of easy care perennials. 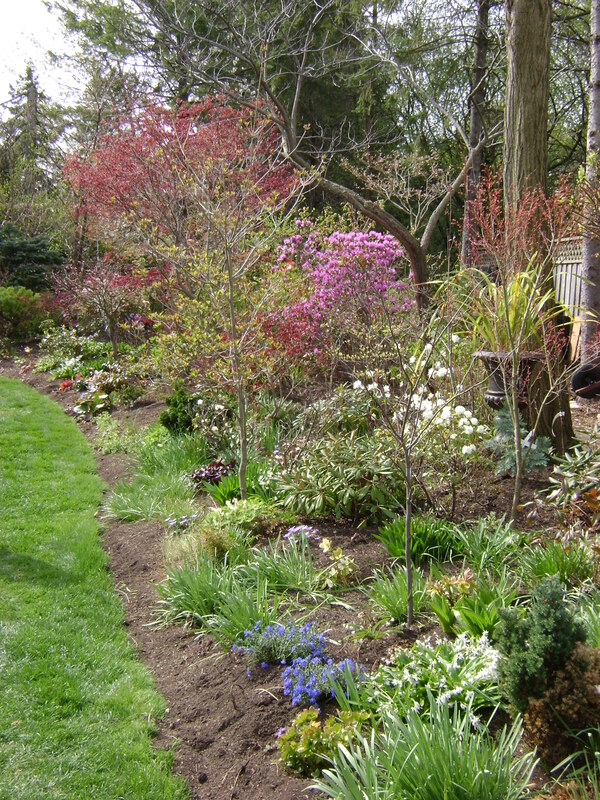 And if you did not want any colour, you could remove all the perennials and between the trees, hedges and ground covers, you still have an exciting and dynamic garden. I LOVE it! 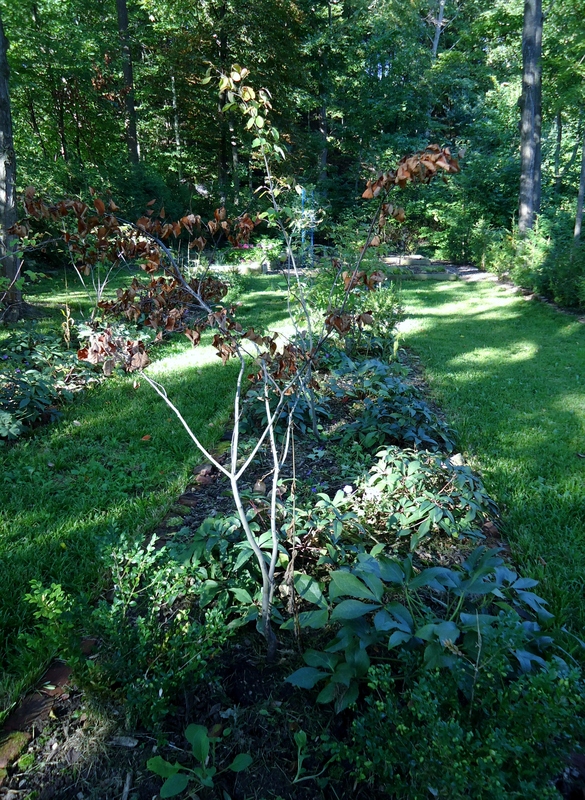 October 20, 2011 · Filed under trees	· Tagged Acer palmatum 'Butterfly', allee, Amelanchier canadensis, japanese maple, lime walk, serviceberry, Tilia cordata "Greenspire"
It was sheer magic for me when I was home at Kilbourne Grove, even with all the weeding. I was very happy to see how much plants had grown over the summer, but there were a couple of casualties as well. Why are they always one of a group? It just makes it so much hard to have a uniform presence, I know, don’t tell me, the magic of Mother Nature. I am sure that everyone knows I am trying to start a pleached lime walk at Kilbourne Grove. It was planted in 2009, you can read about that here. 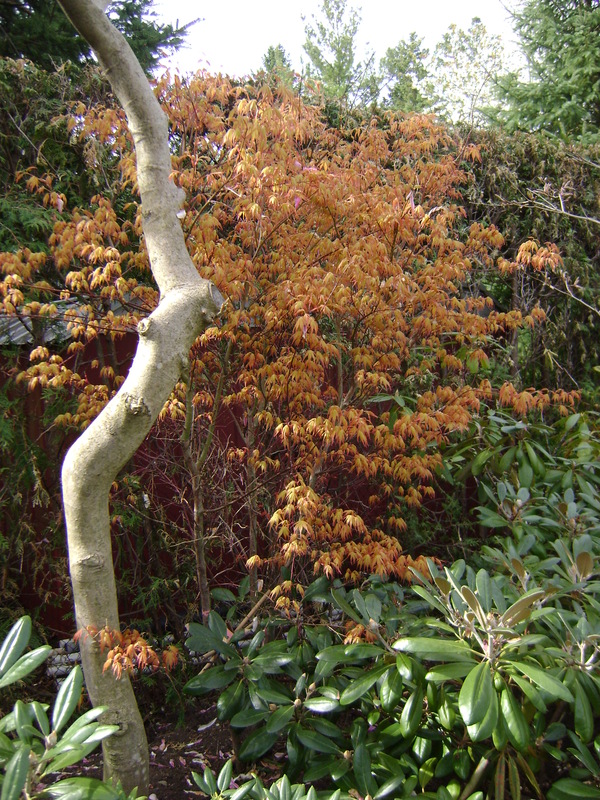 I planted the bare root dormant Tilia early that spring and one never developed its leaf buds. So in 2010 I replaced that tree, and as they came in lots of 5, added to the length of the walk. 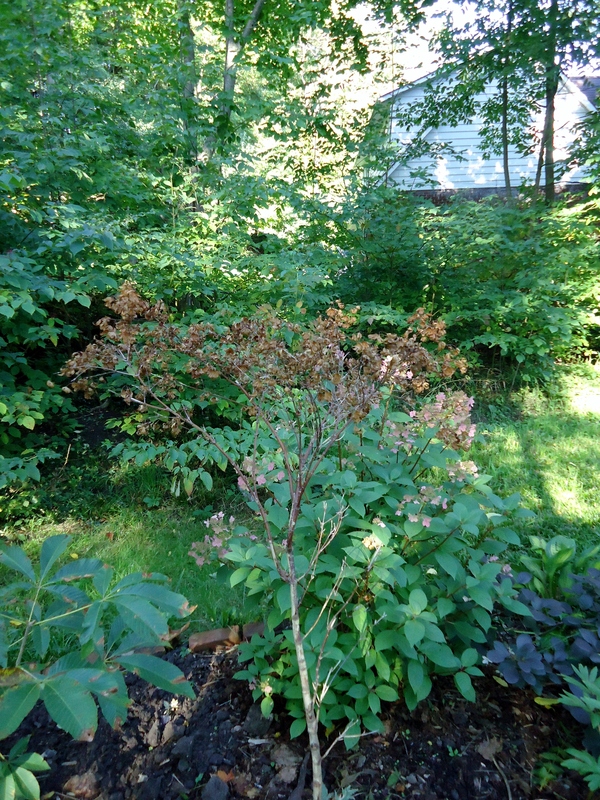 This spring, despite all leafing out and looking wonderful, when I returned in August, one had dead leaves. It was the smallest of them all, and had been struggling to grow. And now has failed. 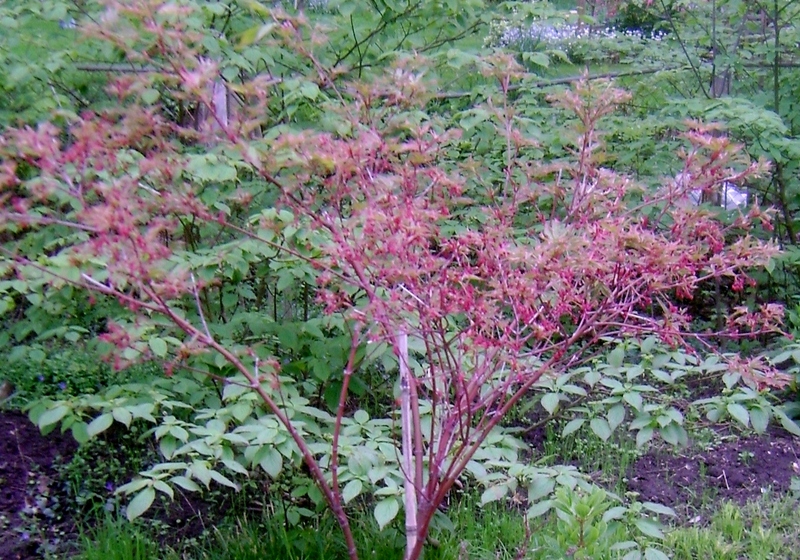 I am at a bit of a loss as what to do now, I can order 5 more trees from Yesterdays Garden, but only need one, and certainly can not extend it any more. I did read somewhere that professional gardeners will heel extra trees in somewhere, in case of a tree dying in an avenue. Then they have one at hand to replant. How many years could I leave extra trees in my Kitchen Garden, before they would be too large to move? Some thought is required. And of course one of the Amelanchiers in my Allee did the exact same thing. And one of the trees that had been planted almost three years ago, not one of the newer ones. This tree will be a lot easier to add in, luckily it is on the end of the Allee. 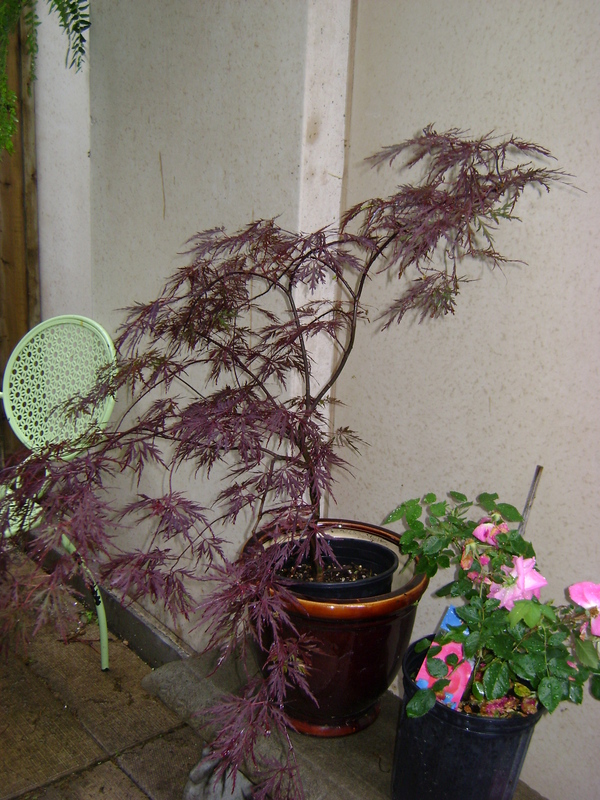 When I was living in Toronto, we had a number of Japanese maples in pots on our terrace. It was lovely having something growing (and hiding much of the concrete) all summer, and I used to heel them into the Kitchen Garden for the winter, before dragging them out the next spring and moving them back to Toronto. 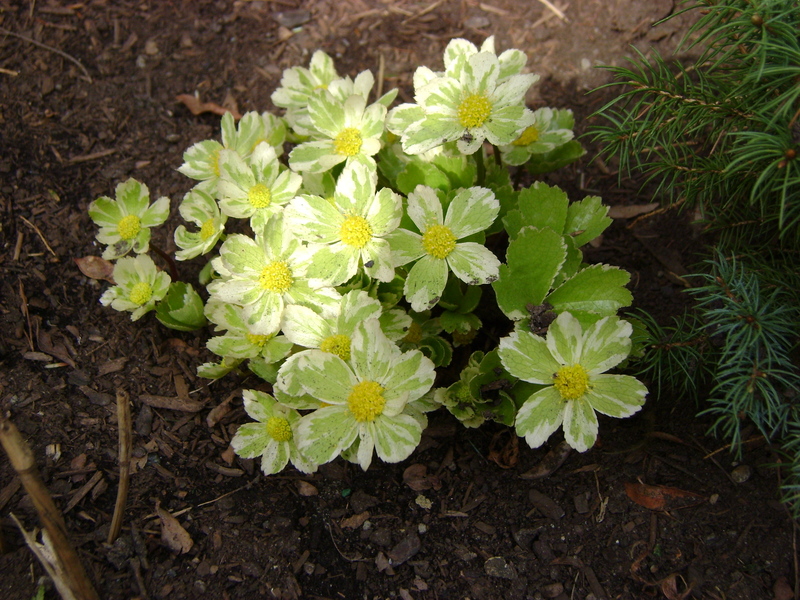 When we got the news we were moving to Barbados, I had to permanently plant them into the ground at Kilbourne Grove. All came through their first winter nicely, and looked lovely when I left the end of May. 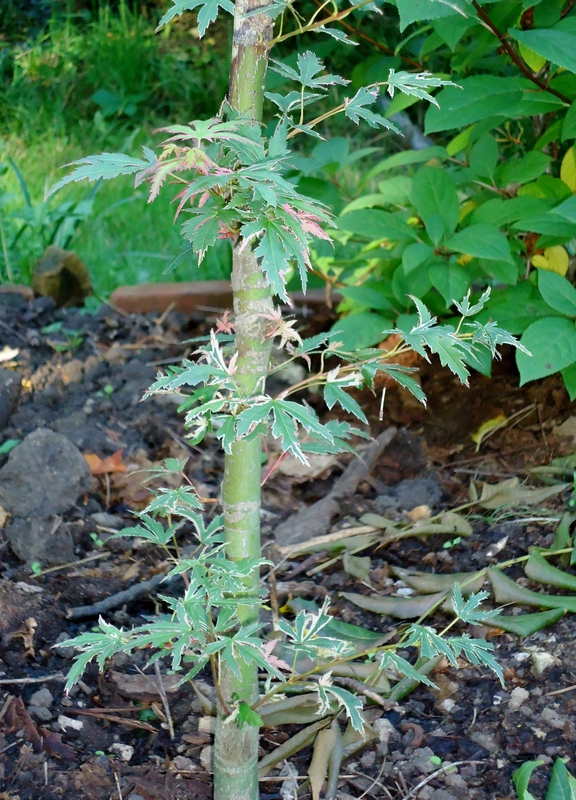 But when I returned the ‘Butterfly’ Japanese Maple was crispy as well. how pink and white and green they are, is seems I might have a ‘Butterfly’ shrub instead of a standard, and that is perfectly fine with me. I live in the big city, the concrete jungle! Millions of teeming people, like ants, come into the downtown area to work everyday, but no not me, I live downtown. Surrounded by concrete, asphalt and very tall office towers, there is very little green (or sky) to see. Although I was very insisent lucky to get a condo with a ground floor terrace. 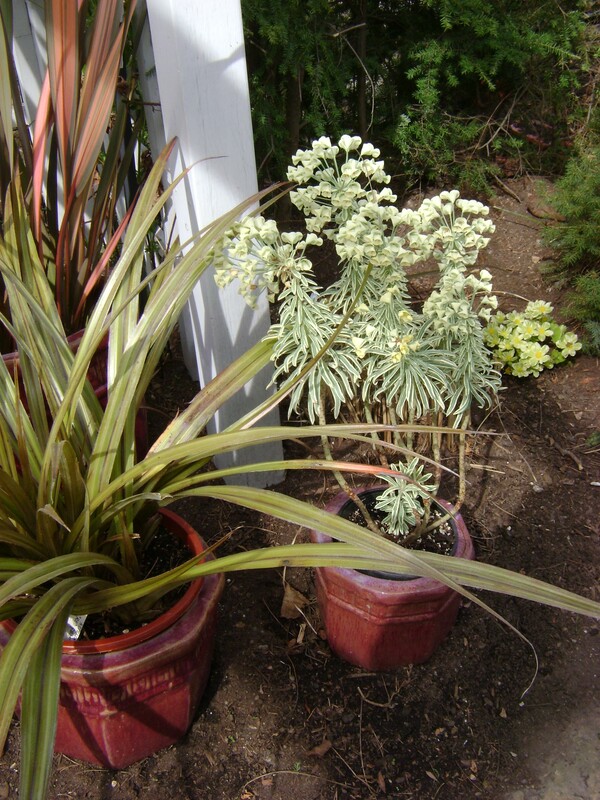 But it is also concrete, yes I do have a few containers planted up, and there is a tree planted in the ground, with 6 inches of soil all around him, allowing the rain (and the gardener) to water him. But look, where did this come from? Something magical has happened in my concrete jungle! 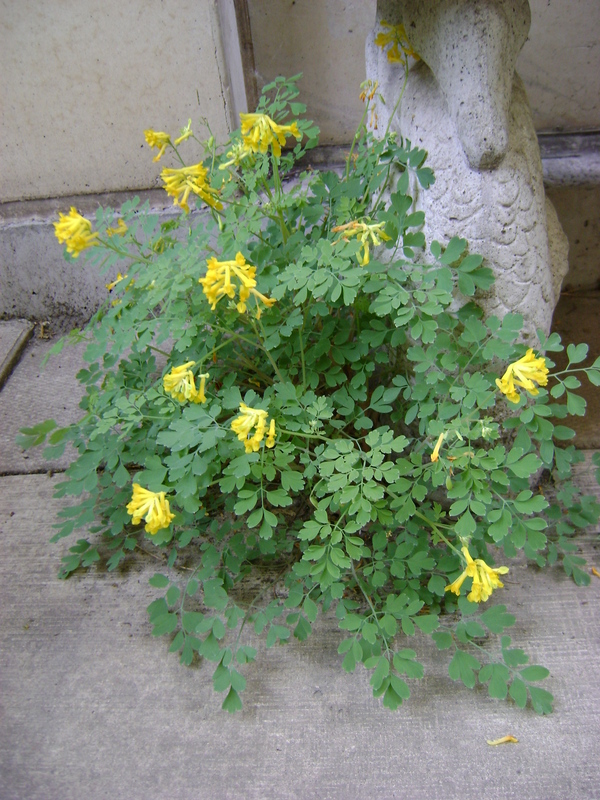 I did buy a Corydalis lutea last year for my garden in Owen Sound, and I did have that plant on my terrace in Toronto, but it was only for one day, I swear. Who would have guessed that concrete is fertile! I’m turning Japanese, I really think so! 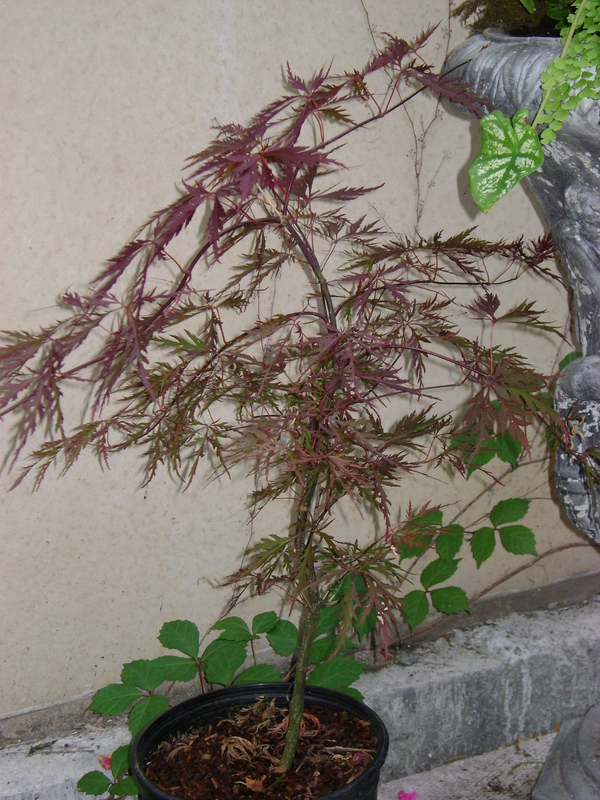 I bought another Japanese Maple today, how can your say no to a $20 red cutleaf weeping beauty. It is another “Red Dragon” so that makes two. I am hoping to plant them up in matching pots (probably terra cotta) and flank the garage at Kilbourne Grove, or on the terrace in Toronto. I was reading Margaret Roach’s blog “A Way To Garden” and she overwinters hers in her unheated garage. She just wheels them in and ignores them. Towards the end of the winter, when the soil starts to thaw, she will give them a drink or two. 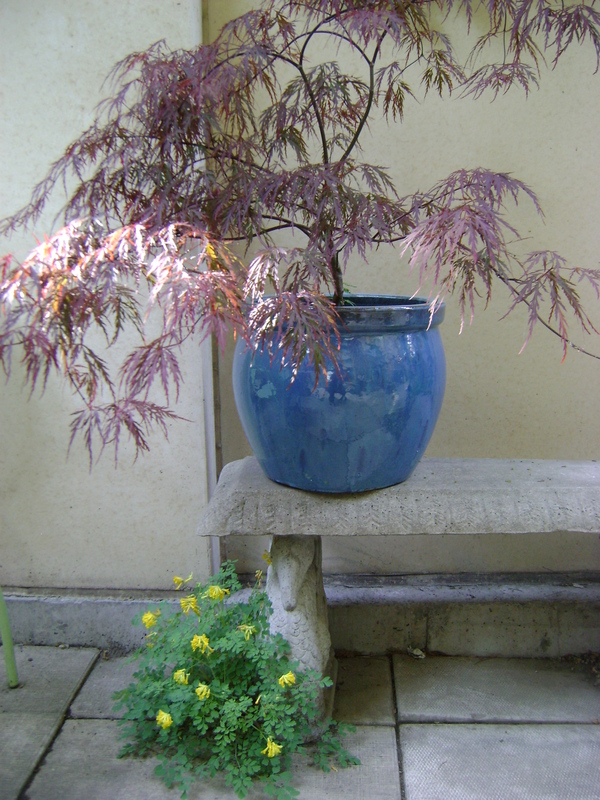 When I lived in Kingston, I had a very small Japanese maple in a 6″ terra cotta pot. I would dig a hole in the garden and sink the pot. 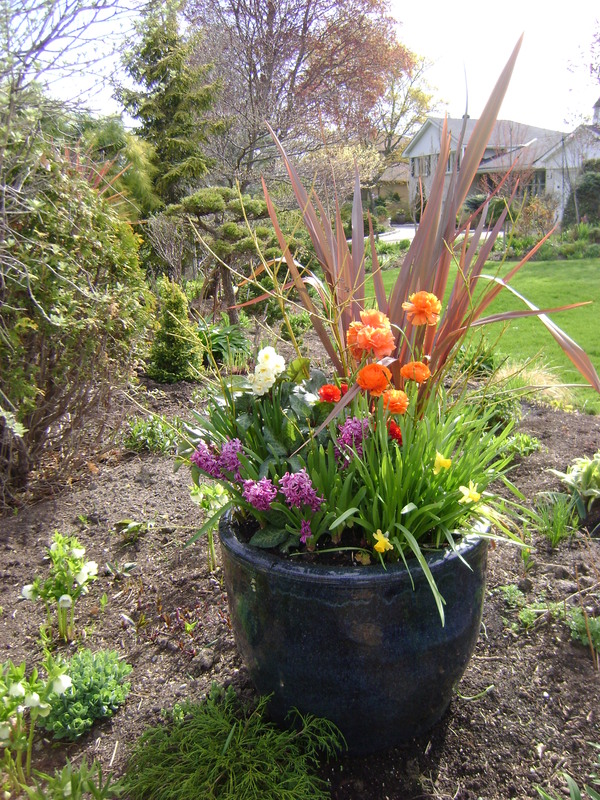 When it warmed up in the spring, I would lift the pot and place it on my porch. This went on for a few years till I moved to England and I gave it away. Unfortunately (or fortunately) as the case may be, these are too large to be digging a hole. So I plan on trying Margaret Roach’s method and crossing my fingers that it works just as well for me. I forgot to mention the green weeper “Waterfall” that I bought on Fathers Day. Not for my father, he kills them, but for me!!! I repeat, how can you say no for $20.00. cutleaf weeping beauty. 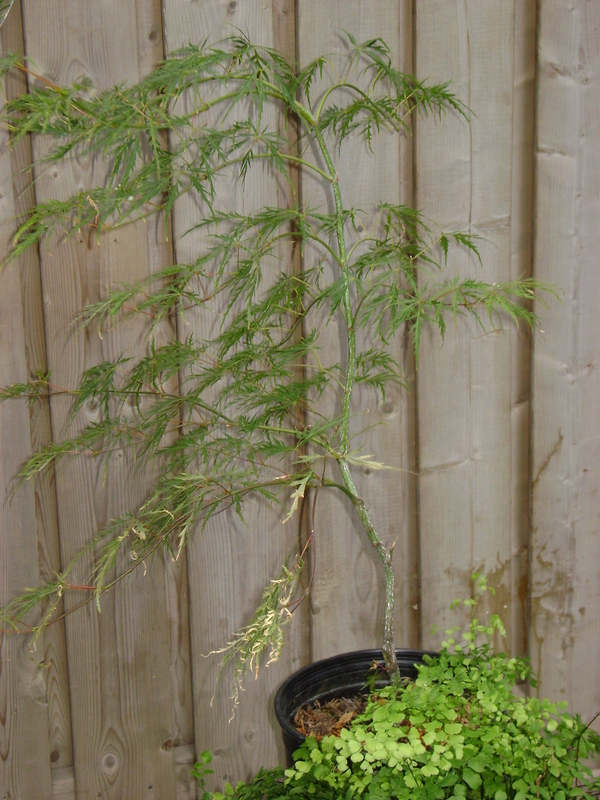 I realized after I looked at my Japanese maples again that my red Dragons are two different sizes. My first I bought for $30.00 When you look at them, it was the better buy, the stem is much thicker, in comparison, the $20 is only a whip. And how about “Waterfall”, isn’t he a pretty boy? As much as I love burgandy/red foliage, it is nice to have a contrast every once in a while and this is it. He got a little sunburnt, as Loblaws had him right out in the scorching sun, but other then that he is in good shape.